OBJECTIVE: To determine the prevalence of malocclusion and orthodontic treatment need in a sample of Omani adolescents aged 11–16 years. MATERIALS AND METHODS: The total sample included 854 adolescents with 387 boys and 467 girls between the age of 11 and 16 years with no previous orthodontic treatment history. The study design was cross-sectional. The parameters studied were skeletal relationship, lip competency, teeth impactions, missing teeth, contact point displacement, crowding, spacing, incisors and molars classification, overjet, overbite, crossbite, oral hygiene and caries. The Index of Orthodontic Treatment Need (IOTN) was used to study the need for orthodontic treatment for the total sample. RESULTS: There was a high prevalence of Class I jaw relationship (86.2%). About 81.6% of the sample studied had Class I molar relationship and 73.8% had Class I incisors relationship. About 61.4% of the sample had no contact displacement, while 5.2% had contact displacement >4 mm. Severe crowding in the maxilla was found in 2.3% while spacing was found in 24.2%. Around 11% of the sample studied had Class II div 1 incisors relationship, 13.5% Class III and only 1.8% had Class II div 2 incisors relationship. Only 8.6% of the sample studied had an overjet >6 mm while 16.3% had a deep bite and 0.2% had anterior open bite of >4 mm. Teeth impaction was found in 11.7% while permanent missing teeth was present in 1.8%. The results showed that 13.9% had a very great need for treatment while 43.2% of the sample did not need any treatment. CONCLUSION: Among the Omani adolescents, there was a high prevalence of Class I jaw relations and Class I molar relationship. The prevalence of malocclusion and treatment need in Omanis shows some variation when compared to other ethnicities. Malocclusion is not a disease but a disorder. The orthodontic literature contains a large number of studies on the prevalence of malocclusion in different populations.,,,,,,,,, Studying the prevalence of occlusal traits in isolated human populations can provide valuable information regarding the aetiology of malocclusions and other complex traits. In most of the studies, quantitative variables along with the Angle's classification were used to study the malocclusion. Tang and Wei described many methods to study malocclusion. They classified the methods as qualitative and quantitative. Qualitative variables define only the presence or absence of a selected malocclusion criterion. Angle's classification has been widely used as a qualitative epidemiological tool for malocclusion assessment. Despite the amount of literature on the subject,,,,,,,,,, there have been very few studies on the population of the Gulf region and there are no epidemiologic studies specific to the Omani population. The aim of the present study was, therefore, to document the prevalence of individual traits of malocclusion and orthodontic treatment need in a sample of Omani adolescents aged 11–16 years who represent the most common orthodontic treatment age group. Omani descent (both parents and grandparents must be of Omani Arab origin without any interracial marriage disregard of the country of born or language spoken). Ethical approval was obtained from the research and ethics committee of Al Nahdha Hospital, Ministry of Health, Sultanate of Oman and permission to examine the children from the Ministry of Education in Oman. The characteristics studied were as follows: skeletal malocclusion, competency of lips, oral hygiene, number of dental caries, presence or absence of impacted teeth, missing teeth, contact point displacement, crowding of maxillary and mandibular teeth, spacing, incisor classification, overjet, overbite, open bite, midlines, crossbites, supernumerary, submerged deciduous teeth, molar relation and presence of cleft lip or palate. The skeletal malocclusion was recorded as Class I, II or III based on chairside clinical evaluation using two finger method (index and middle finger) only and not using radiographs. The evaluator's index finger is placed in the subject's soft tissue point A and the middle finger is placed in soft tissue point B. If the fingers and hand are pointed horizontally the patient is classified as Class I, if the hand points upwards the patient is Class II and if downwards then the patient is classified as Class III. Lip competency was recorded as competent if the subject's lips were touching without strain during resting position or non-competent if the lips had strain or were not touching at rest. Oral hygiene was recorded as good or poor based on visual observation considering the amount of plaque and calculus present. The number of caries present was recorded from 0 to 9. The presence or absence of impacted teeth and missing teeth was recorded and confirmed by dental panoramic radiograph. A tooth was considered impacted if it had not erupted in the oral cavity beyond the average time of its eruption and the root is completely formed or at least two-third of the root is formed. Contact point displacement was measured and recorded in three groups – 0 mm, 0–4 mm and above 4 mm. Crowding in the maxillary and mandibular arches was recorded as absent, mild, moderate and severe (1–3 mm = mild; 4–6 mm = moderate; >6 mm = severe). The incisor relationship was recorded as Class I, II div 1, II div 2 and III. Overjet was measured as the horizontal distance between the labial surfaces of the maxillary and mandibular central incisors. The distance was measured with a ruler. Overjet was recorded in two categories – less than and more than 6 mm. The overbite was considered normal if the maxillary central incisors overlapped the incisal third of the crown of the mandibular central incisors. The overbite was classified as increased if the overlap exceeded the middle third of the crown of the mandibular central incisors and reduced if it was less than incisal third of the crown. Open bite was recorded as absent, <4 mm and >4 mm. Midlines were observed and recorded as dental midline centred (c) and non-centred (nc). Crossbite was recorded as absent, anterior crossbite, posterior crossbite or anterior and posterior crossbite present. Presence or absence of supernumerary teeth and submerged teeth was recorded. The molar relationship was recorded as Class I, II or III for the right and left sides. Presence or absence of cleft lip/palate was recorded. The demand for orthodontic treatment was also recorded and so was the IOTN. The findings served to determine orthodontic treatment need (IOTN)., Categories such as no treatment need, borderline need or great need were based on 5 grades in the DHC and 10 grades in the AC. The examinations were completed in 6 months by the same examiner. Intra examiner reliability tested by re-examining 30 subjects after a period of 1 month was (r = 0.9) high. The acceptable error margins allowed us to proceed. Number and percentage of subjects with the mentioned parameters was calculated. Number of subjects with diagnosed anomaly (n) and its prevalence (n/N × 100, where N is the number of subjects examined) was determined. The data were coded, entered into a computer and analysed with the SPSS software package (version 13.0, SPSS Inc., Chicago, III., USA). Descriptive statistics were performed regarding all the parameters [Table 1] and [Table 2]. The results are depicted in [Table 1]. There was a high prevalence of Class I jaw relationship (86.2%). In this sample, 9.6% had skeletal Class II and 4.2% had skeletal Class III relations. About 81.6% of the sample studied had Class I molar relationship, 14.2% had Class II and 4.2% had Class III molar relationship. This was for the right-side molars. The left-side molar relationship was similar with only slight differences as seen in [Table 1]. In the sample 73.8% had Class I incisors relationship. Around 94.8% had competent lips. Although only 55% were found to have good oral hygiene, 72.2% had no caries. About 61.4% of the sample had no contact displacement while 5.2% had contact displacement >4 mm. Severe crowding in the maxilla was found in 2.3% while spacing was found in 24.2%. About 11% of the sample studied had Class II div 1 incisors relationship, 13.5% had Class III and only 1.8% had Class II div 2 incisors relationship. Only 8.6% of the sample studied had an overjet >6 mm while 16.3% had a deep bite and 0.2% had anterior open bite of > 4 mm. Teeth impaction was found in 11.7% while permanent missing teeth was present in 1.8%. The results showed that 13.9% had a very great need for treatment while 43.2% of the sample did not need any treatment. 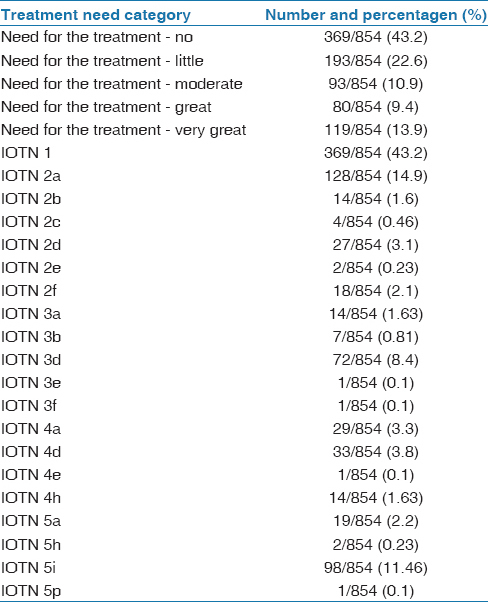 [Table 2] provides the descriptive statistics of the treatment need [Table 1] and [Table 2]. Although many studies have been published that describe the prevalence of malocclusion, it is difficult to compare them because of the varying methods and indices used to assess and record malocclusion and differing sample sizes. In our study we found that 86.2% of the sample of the Omani adolescents had Class I skeletal relationship, 9.6% had skeletal Class II and 4.2% had skeletal Class III relations. The skeletal bases classification was based on clinical examination only and a lateral cephalometric radiograph might confirm the clinical results. However, it is not ethical to expose the subjects to radiation for the sake of the study. In a study on prevalence of skeletal malocclusion in Saudi Arabia, it was found that 42% of the sample had skeletal malocclusion and among them 49% reported with Class III skeletal deformity. Such high prevalence could be attributed to the fact that the study was conducted only on patients seeking treatment in the orthodontic centre. We found that 81.6% of the sample had Class I molar relationship. Although Angle's classification does not incorporate vertical and transverse abnormalities, it is a universally accepted system that is reliable and repeatable and minimizes examiner subjectivity. In a similar study on a sample from the Kuwaiti adolescent population only 57.8% had Class I molar relationship. This difference could be due to the innate racial differences or due to the strict criteria used in the latter study to define Class I molar relationship. In another study Class I malocclusion was found in 34.9% of the 2329 individuals examined, Class II div 1 in 40.0%, Class II div 2 in 4.7% and Class III malocclusion was found in 10.3% of the sample. Onyeaso found that Class I malocclusion was more common in Nigerian adolescents (50%). In a study by Silva and Kang, latin adolescents demonstrated a higher rate of Class I malocclusion of 69.4%. Hence there are definite racial differences in the incidence of malocclusion. Ethnic background of the sample may result in higher or lower rates of some anomalies. According to Stecker et al., dental practitioners who are aware of ethnic differences in the occurrence of dental anomalies will be more aware in finding them in patients during routine examinations, and may be predictive of normal patterns of tooth development and/or eruption, allowing for prompt clinical intervention to avoid complicating pathology. In our study the presence of impacted teeth was found to be 11.7% in Omanis. This did not include third molars. In another study conducted on a sample from the western region of Saudi Arabia it was found that the incidence of impaction (excluding third molars) was 21.2% which was higher than that found in Omanis. The lower incidence in Omani's could be due to the fact that the sample was from school children and not from only those seeking treatment. In our study the prevalence of supernumerary teeth was found to be 0.2% among Omanis. The prevalence reported in the literature ranges from 0.1 to 3.8% of the population depending on the race.,, Bäckman and Wahlin conducted a clinical study by examining 739 Caucasian children and found 14 cases (1.9%) of at least one supernumerary tooth, and the majority of the supernumerary teeth reported were mesiodens. Salem investigated the incidence of supernumerary teeth in a sample of 2393 Saudi Arabian children and found that only 0.5% sample studied had at least one supernumerary tooth. Congenitally missing teeth were found to be the most prevalent anomaly (25.7%) in Saudi populations. But in our study only 1.8% of the sample studied had missing teeth. This could be due to the fact that the sample studied among Arabs included both adults and adolescents and the Saudi race is heterogeneous in nature. In our study on Omani population it was found that the contact point displacement in anteriors was 0 mm in 61.4%, 0–4 mm in 33.5% and >4 mm in 5.2% of the sample studied. In another study severe irregularity of >6.5 mm was equally prevalent (about 10%) in both arches among Kuwaiti sample. Hence we can conclude that Omanis had a lesser prevalence of severe contact point displacement than the Kuwait sample. In this study it was also found that severe crowding in the maxilla was 2.3% of the sample and 72.4% of the sample did not have crowding in the maxilla while 62.3% did not have crowding in the mandible. Crowding in the anterior segment of one or both arches was the most frequent of all anomalies recorded (65.2%) in the Central Anatolian adolescents by Gelgör et al. In this study anterior crowding was greater in the upper arch than the lower arch but in the Omani sample it was found that the reverse was true. The National Health and Nutrition Survey III, undertaken in the United States between 1989 and 1994, showed a frequency of crowding ranging from 42.3% at ages 8–11 years to 54.5% at ages 12–17 years. This was higher than what we found in the Omani sample. In our study it was found that 73.8% had Class I incisors relationship. About 11% of the sample studied had Class II div 1 incisors relationship, 13.5% had Class III and only 1.8% had Class II div 2 incisors relationship. In previous studies, done on other populations there has been no separate examination of incisor relation independent of molar relation and the results are expressed as Class I, Class II div 1, Class II div 2 or Class III as an overall sagittal relation. Hence comparisons cannot be drawn between the two. About 24.2% of our sample had spacing in the maxilla only. In Kuwaiti adolescents 29.3% were found to have maxillary anterior spacing. Only 8.6% of our sample studied had an overjet >6 mm. In a study on Kuwaiti adolescents the mean overjet was 3.5 ± 2.0 mm ranging from –6.0 to 12.0 mm. In another study the prevalence of increased overjet was 25.1%. In a French sample, increased overjet was present in fewer subjects (6%). In our study anterior open bite was absent in 97.8% of the sample and anterior open bite >4 mm was present in 0.2% of the sample. In the Central Anatolian adolescents, the prevalence of open bite was 8.2% which was higher than the values we found in Omani population. Deep bite prevalence was 16.3%. In another study the prevalence of open bite and deep bite malocclusions were found to be 7.9 and 22.0%, respectively in Kuwaiti adolescents. Increased overbite was recorded in 18.3% of the Central Anatolian adolescents. In another study of the vertical anomalies, increased overbite was more than twice as frequent as anterior open bite. In our sample too deep bite was more frequent than open bite. In this study 6.8% had posterior crossbite. In another study posterior crossbite was observed in 9.5% of the sample. Perillo et al. showed a higher percentage for crossbite (14.2%). In this study it was found that the prevalence of cleft lip/palate was 0.1% in Omanis. Another study found the highest rates for any oral cleft, isolated cleft palate and cleft lip with and without palate in the white (non-Hispanic) population. The prevalence of cleft lip and/or palate reported in Saudi Arabia varied greatly from 0.3 to 2.4 per 1000 live births. Güray et al. used the Treatment Priority Index, and found 72.26% of 483 primary school students from Konya district (Anatolia) required orthodontic treatment. In another study by Gelgör et al. which included a wide adolescent sample malocclusion the need for treatment was found to be 89.9%. In a study by Bilgic et al., according to the DHC of the IOTN, 28.7% of the whole sample was classified as being in need of orthodontic treatment (grades 4 and 5). The results showed that the percentage was relatively greater than those reported by Souames et al. in France and Perillo et al. in Italy (21.3% and 27.3%, respectively). However, the British studies found a higher prevalence rate for untreated subjects: 32.7%, 33% and 35%. Josefsson et al. found 39.5% of orthodontic treatment need in a Swedish sample. Among the Omani population, the present study found that there was moderate need for the treatment in 10.9%, great need for the treatment in 9.4% and very great need for the treatment in 13.9% of the sample. The detailed IOTN values are given in [Table 2]. The findings of the present study, therefore, indicated that a substantial need for orthodontic intervention was present, but it was generally lower than northern European populations. In our study the sample was not balanced between male and female subjects since it was based on availability. The percentage of males was 45% and females was 54%. This is one of the potential drawbacks of this study. Also the sample was derived from students in schools and not only from those seeking orthodontic treatment who came to any clinic or hospital. If the sample had included only those seeking treatment then the percentage of malocclusion would have been higher. To avoid this the sample was taken from school students regardless of their desire for treatment. It is accepted that several genetic and environmental interacting factors are related to the aetiology of malocclusions. In this study the sample was homogeneous with respect to ethnic background by excluding non-Omani subjects and also Caucacian, African and Chinese. Although, the examined group was not randomized, this was the first study to be undertaken on Omani population and therefore it provides an insight about the prevalence of malocclusion in Oman. Our findings may therefore serve as a reference when planning orthodontic services in Oman and when comparing prevalence of different types of malocclusion traits between Omani and other ethnic groups. Among Omani adolescents there was a high prevalence of Class I jaw relations and Class I molar relationship. The results showed a small percentage had a very great need for treatment while a moderate percentage of the sample did not need any treatment. There were slight differences between the values found for Omanis compared to other populations which can be attributed to racial differences or differences in methodology and selection criteria. Trottman A, Elsbach HG. Comparison of malocclusion in preschool black and white children. Am J Orthod Dentofacial Orthop 1996;110:69-72.
de Muñiz BR. Epidemiology of malocclusion in argentine children. Community Dent Oral Epidemiol 1986;14:221-4. Thilander B, Pena L, Infante C, Parada SS, de Mayorga C. Prevalence of malocclusion and orthodontic treatment need in children and adolescents in Bogota, Colombia. An epidemiological study related to different stages of dental development. Eur J Orthod 2001;23:153-67. Kerosuo H. Occlusion in the primary and early mixed dentitions in a group of Tanzanian and Finnish children. ASDC J Dent Child 1990;57:293-8. Tschill P, Bacon W, Sonko A. Malocclusion in the deciduous dentition of Caucasian children. Eur J Orthod 1997;19:361-7. Isiekwe MC. Malocclusion in Lagos, Nigeria. Community Dent Oral Epidemiol 1983;11:59-62. Kerosuo H, Laine T, Kerosuo E, Ngassapa D, Honkala E. Occlusion among a group of Tanzanian urban schoolchildren. Community Dent Oral Epidemiol 1988;16:306-9. Brunelle JA, Bhat M, Lipton JA. Prevalence and distribution of selected occlusal characteristics in the US population, 1988-1991. J Dent Res 1996;75 Spec No: 706-13. Otuyemi OD, Ogunyinka A, Dosumu O, Cons NC, Jenny J. Malocclusion and orthodontic treatment need of secondary school students in Nigeria according to the dental aesthetic index (DAI). Int Dent J 1999;49:203-10. Ciuffolo F, Manzoli L, D'Attilio M, Tecco S, Muratore F, Festa F, et al. Prevalence and distribution by gender of occlusal characteristics in a sample of Italian secondary school students: A cross-sectional study. Eur J Orthod 2005;27:601-6. Rudan I, Campbell H, Rudan P. Genetic epidemiological studies of Eastern adriatic Island isolates, croatia: Objective and strategies. Coll Antropol 1999;23:531-46. Bilgic F, Gelgor IE, Celebi AA. Malocclusion prevalence and orthodontic treatment need in central anatolian adolescents compared to European and other nations' adolescents. Dental Press J Orthod 2015;20:75-81. Tang EL, Wei SH. Recording and measuring malocclusion: A review of the literature. Am J Orthod Dentofacial Orthop 1993;103:344-51. Evans R, Shaw W. Preliminary evaluation of an illustrated scale for rating dental attractiveness. Eur J Orthod 1987;9:314-8. Thilander B. Prevalence of malocclusion and orthodontic treatment need in children and adolescents in Bogota, Colombia. An epidemiological study related to different stages of dental development. Eur J Orthod 2001;23:153-68. Silva RG, Kang DS. Prevalence of malocclusion among Latino adolescents. Am J Orthod Dentofacial Orthop 2001;119:313-5. Almasri M. The prevalence of skeletal malocclusion in the Southern Aseer region of Saudi Arabia. Am J Med Sci Med 2014;2:13-5. Behbehani F, Artun J, Al-Jame B, Kerosuo H. Prevalence and severity of malocclusion in adolescent Kuwaitis. Med Princ Pract 2005;14:390-5. Gelgör IE, Karaman AI, Ercan E. Prevalence of malocclusion among adolescents in central anatolia. Eur J Dent 2007;1:125-31. Onyeaso CO. Prevalence of malocclusion among adolescents in Ibadan, Nigeria. Am J Orthod Dentofac Orthop 2004;126:604-7. Baccetti T. A controlled study of associated dental anomalies. Angle Orthod 1998;68:267-74. Stecker SS, Beiraghi S, Hodges JS, Peterson VS, Myers SL. Prevalence of dental anomalies in a Southeast Asian population in the minneapolis/Saint paul metropolitan area. Northwest Dent 2007;86:25-8. Afify AR, Zawawi KH. The prevalence of dental anomalies in the Western region of Saudi Arabia. ISRN Dent 2012;2012:837270. Salem G. Prevalence of selected dental anomalies in Saudi children from Gizan region. Community Dent Oral Epidemiol 1989;17:162-3. Bäckman B, Wahlin YB. Variations in number and morphology of permanent teeth in 7-year-old Swedish children. Int J Paediatr Dent 2001;11:11-7. Proffit WR, Fields HW Jr., Moray LJ. Prevalence of malocclusion and orthodontic treatment need in the United States: Estimates from the NHANES III survey. Int J Adult Orthodon Orthognath Surg 1998;13:97-106. Perillo L, Masucci C, Ferro F, Apicella D, Baccetti T. Prevalence of orthodontic treatment need in Southern Italian schoolchildren. Eur J Orthod 2010;32:49-53. Saad AN, Parina RP, Tokin C, Chang DC, Gosman A. Incidence of oral clefts among different ethnicities in the state of California. Ann Plast Surg 2014;72 Suppl 1:S81-3. Sabbagh HJ, Mossey PA, Innes NP. Prevalence of orofacial clefts in Saudi Arabia and neighboring countries: A systematic review. Saudi Dent J 2012;24:3-10. Güray E, Ertaş E, Orhan M, Doruk C. Konya yöresi ilkokul çocuklarında “Treatment Priority Index” (TPI) uygulaması (epidemiyolojik çalışma). Turk J Orthod 1994;7:195-200. Souames M, Bassigny F, Zenati N, Riordan PJ, Boy-Lefevre ML. Orthodontic treatment need in French schoolchildren: An epidemiological study using the index of orthodontic treatment need. Eur J Orthod 2006;28:605-9. Josefsson E, Bjerklin K, Lindsten R. Malocclusion frequency in Swedish and immigrant adolescents – Influence of origin on orthodontic treatment need. Eur J Orthod 2007;29:79-87.